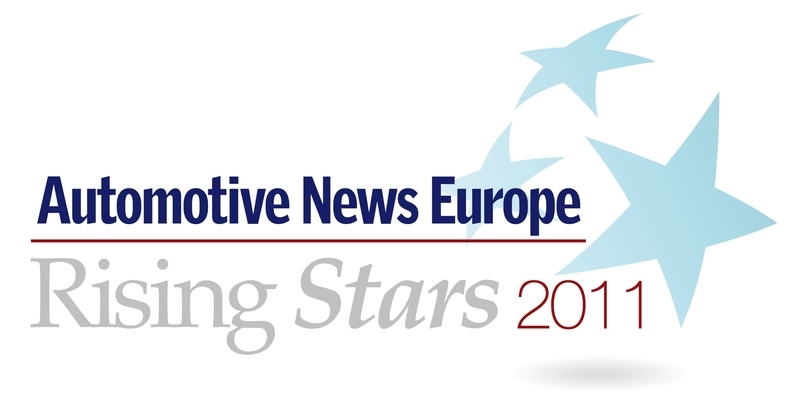 Automotive News Europe is delighted to announced its first winners of the Rising Stars -- a new annual award that honors mid- and upper-level managers who are likely to become CEOs or executive board members in the future. Automotive News Europe will honor the 2011 Rising Stars, and their mentors, at a gala dinner in Cologne, Germany, June 29. The exciting new award is proudly presented by Automotive News Europe and lead sponsors PwC and SpencerStuart. More than a decade ago, in 1998, Automotive News Europe created its Eurostars -- an annual award given to top performers in the industry. The winners usually hold board-level positions. "Now it's time to look at those who are going to be a Eurostar one day: the Rising Stars," said Jason Stein, publisher of Automotive News Europe. "With this award, we honor the women and men who still sit in the second or third row. It is an annual salute to the best, brightest and youngest our dynamic industry has to offer. To those movers and shakers in the industry with names you might not know yet. Those who are up and coming and climbing the career ladder -- the leaders of tomorrow. They drive change and quality, foster innovation, make courageous decisions and thus determine the future success of their companies," Stein added. Automotive News Europe honors managers from every part of the supply chain: designers, engineers, human resources and purchasing experts, manufacturing directors, financial experts as well as sales and marketing directors and CEOs of national sales companies. "It is a truly European award – with talents from France, Germany, Italy, Spain, Sweden and the UK – as well as from the U.S., South Africa and India who work for European companies," said Harald Hamprecht, editor-in-chief of Automotive News Europe. The managers work for automakers such as Audi, Aston Martin, Chevrolet, Ferrari, Fiat, Ford, Kia, Mercedes-Benz, Seat, Toyota, Volkswagen and Volvo. Ten of the 28 Rising Stars work for suppliers such as Continental, Honeywell, Magna, TRW or hidden champions like Dr. Schneider Group and CHEP. "To be excellent is not a question of age. This is why our Rising Stars range in age from 30 to 51," Hamprecht added. Many of the 2011 Rising Star winners were nominated by former Eurostar winners such as Aston Martin CEO Ulrich Bez, Iveco CEO Alfredo Altavilla, VW Group design chief Walter de' Silva, Saab CEO Victor Muller, former Mercedes CEO Juergen Hubbert, Tata boss Ratan Tata, ex-Rolls-Royce and former Maserati head Karl-Heinz Kalbfell. Read interviews of all 27 Rising Star winners in tomorrow's print issue of Automotive News Europe.